Every road trip has a town that surprises you. A place that's supposed to be just a rest stop, a convenient place for lunch. Somewhere that isn't a destination, somewhere born of a necessity - but then it charms you, and you wish you could stay longer. I remember this feeling in Bisbee, Arizona and Springfield Missouri - and this year, Springdale in Utah. We arrived in Springdale late with less than an hour before our dinner reservation - no one told us we'd changed timezones! 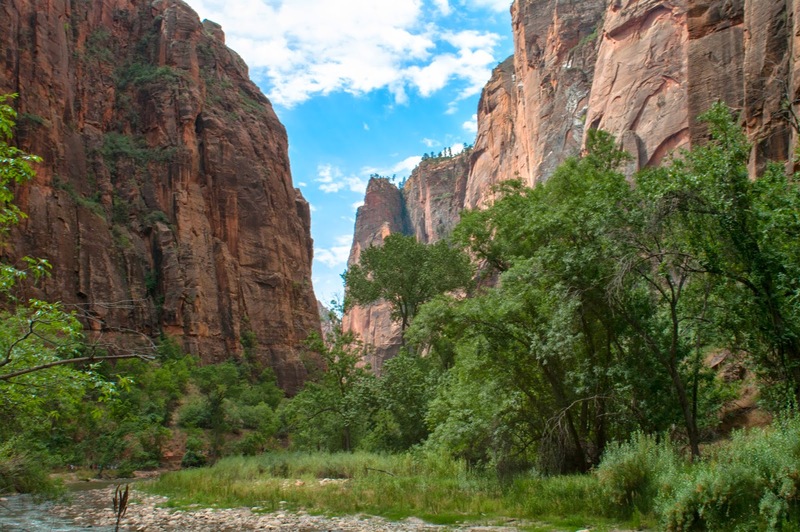 We also planned to leave first thing in the morning for Zion Valley. 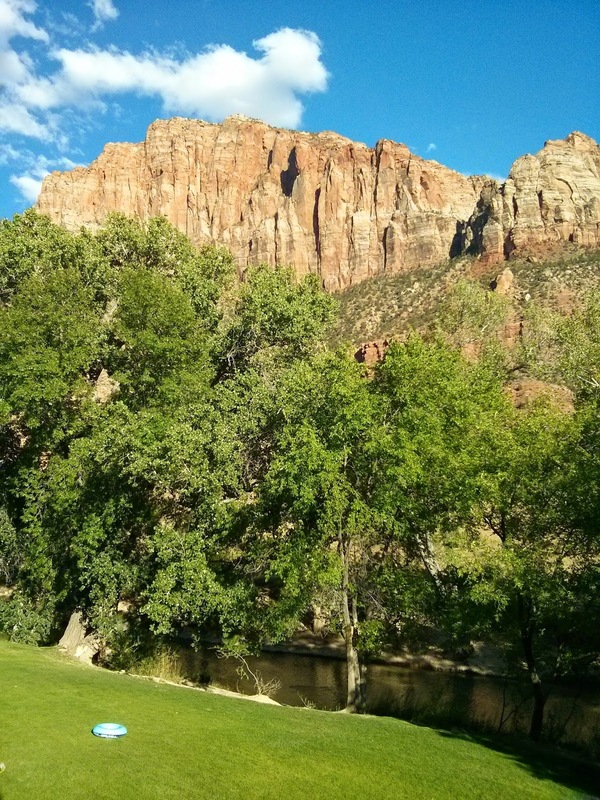 We were staying in Springdale purely for its convenience, nestled as it is just outside the Zion National Park. So we weren't prepared to find Springdale, and especially our hotel (the Desert Pearl Inn), quite so appealing. The hotel room had a balcony over looking the Virgin River that flowed through its grounds, while the canyon walls high above us caught the setting sun. The girls eagerly eyed the pool too, and the little town invited further exploration. However, no such luck - instead we had a mad rush to get to the restaurant on time. Our meal at The Spotted Dog, however, took a surreal turn. I don't really remember what we ate - meatloaf, pasta pesto, steak - but we'll never forget the waiter. He was a tall, lanky chap with a lugubrious tone and he immediately put us in mind of Lurch from the Addams Family. His strangely affected delivery caused us to corpse every time he came to the table - it was as if he'd learned a 'posh waiter' voice from watching too much Downton Abbey. Poor man reduced my daughter to barely suppressed giggles every time he spoke. The food was fine, but the service was an experience. The next morning, we're off on the shuttle bus to the visitors centre, and then on another bus up the canyon (in peak times, no cars are allowed). The bus takes you up the ever narrowing canyon as far as it can - from there you can walk until even that is no longer possible. The truly brave can then continue to trek up the river itself, as the high walls continue to press in. This was another breath taking experience. The walls of the canyon approach 2,000ft high - that's four times the height of our own Cheddar Gorge. The shade from the canyon walls meant it stayed cool and although the park was definitely busy, it was easy to escape the crowds. The end of the trail was enlivened by the presence of the world's cheekiest squirrels - one of whom calmly walked up and took a cereal bar out of my wife's hand, and then boldly ate it in front of her! 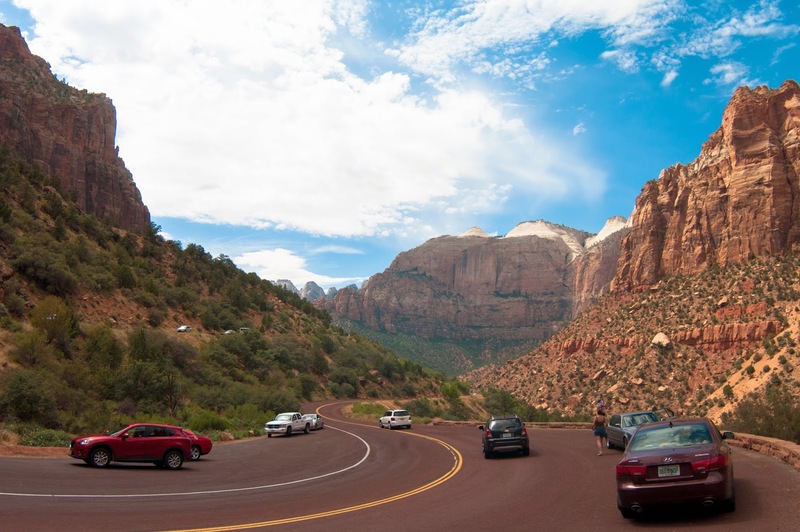 We left Zion bound for our next stop, Bryce Canyon, on what was probably the most scenic and exciting road I've taken to date in the US. To cries of 'slow down', 'mind the edge' and 'we're going to die', we snaked up from the base of the canyon to the flat plateau above. At one point, the Mount Carmel tunnel carves through over 5,000ft of mountainside. The views are jaw dropping, although I suspect my wife had her eyes shut for most of it. Before our road trip was finished we were to do drives that were higher, and even scarier, than this (although possibly not as beautiful), but it's still a once in a lifetime experience. But if you do go, don't treat Springdale as rest stop, like we did. Stay awhile!